Ever wondered what it takes to get started with daily Lean management? Or perhaps you've made an honest effort to get the ball rolling in your organization, but can't get your Lean efforts to take off. Many of the world's leading organizations in manufacturing, healthcare, and other sectors, have embraced “daily Lean management” practices as a framework and a foundation for continuous improvement, engagement, and improved performance. Lean is often misunderstood, and subsequently misapplied, to be merely a set of tools aimed at increasing revenue and decreasing cost. Lean is so much more than just tools and projects, though; a successful Lean culture is dependent upon technical methods, philosophies, and management practices that not only fix problems, but also develop people. These elements combine to create an integrated system. Therefore, an organization that aspires to be Lean must embrace and practice all of the pieces that create the whole. To do this successfully, many organizations utilize five main principles of daily Lean management. 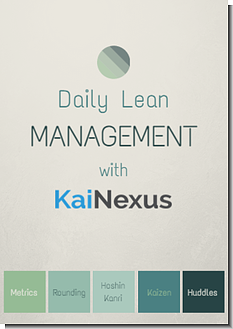 To learn more, download our new FREE eBook Daily Management with KaiNexus!